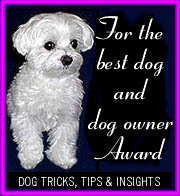 We are now awarding sites that offer quality information or show that they care about helping dogs AND dog owners be the best they can be. 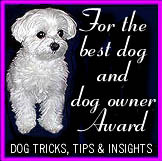 "For the Best Dog and Dog Owner Award." To apply, please add your information in the form below. Winners will be able to choose the award image they prefer. 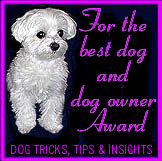 After you put the award image on your site, including the link back to Dog tricks, Tips and Insights, your site will be posted on our winner's list.